Lentil soup is one of those recipes that should be in every cook's repertoire. Lentils are available in most grocery stores and are high in protein, healthy, and very cheap. 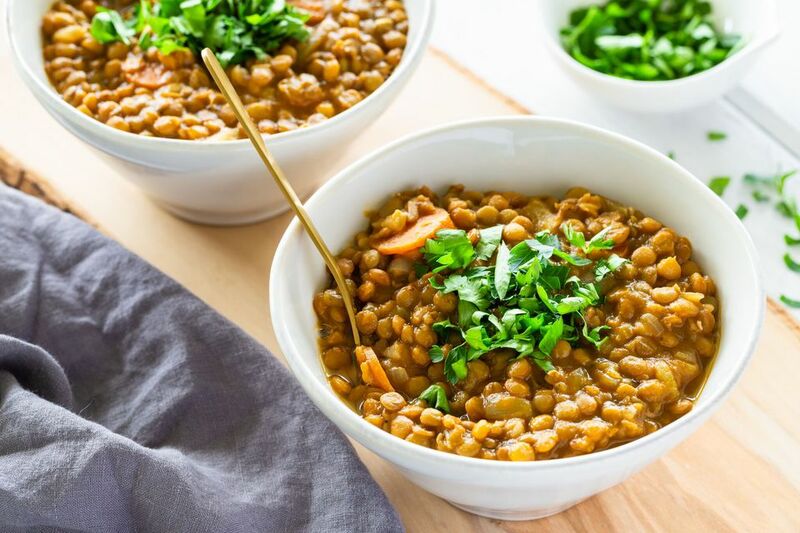 This vegetarian lentil soup recipe uses plenty of seasonings to perk up the soup, including thyme, bay leaves and a bit of lemon juice to brighten all the flavors. Enjoy this traditional and warming dish! I always recommend using sea salt or Kosher salt for the best flavor, and this recipe is no exception. Trust me, it makes a difference. This lentil soup is vegetarian, vegan, low-calorie and low-fat, and with all those lentils, it's also surprisingly high in protein, with nearly 19 grams per serving. It's the perfect vegetarian dinner idea. In a large pot, sauté the onions and carrot in the vegetable oil for 3 to 5 minutes until onions turn clear. Add the vegetable broth, lentils, thyme, bay leaves, and a dash of sea salt or kosher salt and black pepper (you can always add more later when you taste the soup). Reduce heat to a simmer. Cover and cook your soup until the lentils are soft, about 45 minutes. Remove bay leaves and stir in lemon juice before serving. The lemon juice is optional, but it just helps to bring out all the other flavors a bit more. Taste, and season with a bit more salt and pepper to taste, or, serve as is and allow everyone to season as they prefer. If you use a fresh homemade vegetable broth, this recipe is also gluten-free. What Are Some Delicious Homemade Vegetable Soup Recipes? Is it Possible for Soup to Be Raw, Vegan and Delicious?